Yamaha has just launched the Fascino in India and says that the scooter is its offering to the fashion segment. The scooter is priced at Rs 65,000 (on-road Mumbai). 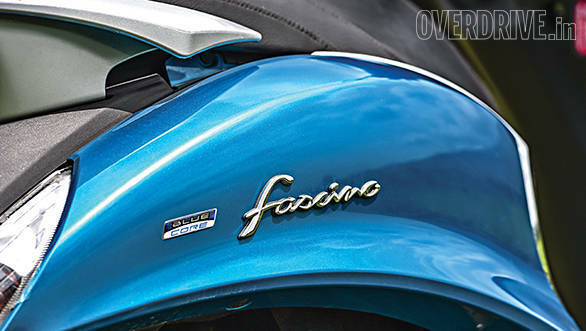 We took it for a not-so-short spin to discover the Fascino's story. It is, in essence, an Alpha/Ray/Z with a smart new wardrobe aimed squarely at those who want a stylish scooter. While Yamaha's TV advert suggests that its designers have taken cues from fashion accessories ranging from pencil heel shoes to sunglasses, the overall design evokes mixed reactions at the OVERDRIVE office. 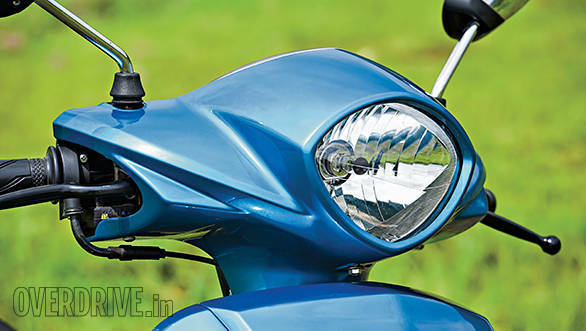 I think that the Fascino looks good when viewed from certain angles and I like the swoopy rear section that endows it with a fresh look that's a refreshing change from the mundane designs that we usually see in Indian scooters. Yamaha calls it neo-retro design and the overall styling does look interesting. There are a lot of chrome touches - mirrors, the lip above the front grille, over the side-panels and above the rear tail lamp that seems like a mandate by the retro design team. Add the sparkly (sassy) cyan colour that you see on our test scooter and all that bling may seem too much. However, if you don't mind the glitz, the Fascino should fit the bill. The fit and finish is typically Yamaha and the body panels fit flush. The paint job is excellent and the plastics look durable as well. The plasto-chrome also looks like it will last a long time. Yamaha chose to use the Ray chassis and that's a great starting point. The Fascino is light, nimble and extremely confident. You immediately understand all the benefits of basing it on the Ray as soon as you start riding. I'm not much of a scooter person, but I felt at home within a few kilometres of riding the Fascino. The chassis, coupled with good suspension offers a planted feel. The telescopic front forks and the unit swing rear suspension offer a great blend of ride and handling. In fact, I took the little scooter for a short off-road excursion and the ride felt plush and compliant. The Fascino is reassuring around corners too. Its flickability as well as its lowly 103kg kerb weight should help you carve your way out of traffic with ease and the wide MRF Nylogrip Zappers contribute to the feeling of a sorted ride. The brakes are good too and offer decent feedback. Yamaha has used the same 113cc, Blue Core engine from the Ray. It produces 7PS at 7,500rpm and 8.1Nm at 5,000rpm. That may not seem extraordinary on paper but the engine feels peppy and responsive. 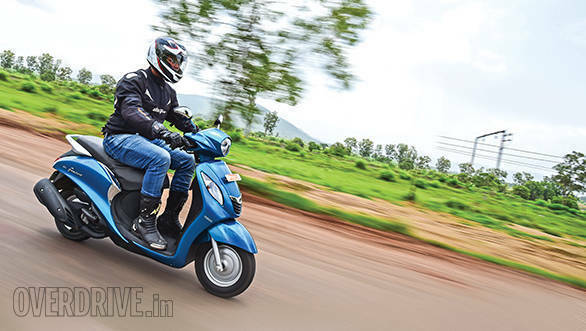 It is wonderfully refined and I loved the way it allows you to sit at full chat on open highways without bothersome vibes from the handlebars and floorboard. In city traffic, power was adequate and there is decent thrust upto 60-65kmph. The seat is well designed and the riding posture should be comfortable for an average sized person. Also, the 775mm seat height should enable you to keep your feet flat on the ground when you stop. However, if you are as tall as Rishaad (he is over 6 feet tall), the handlebar will brush against your knees. 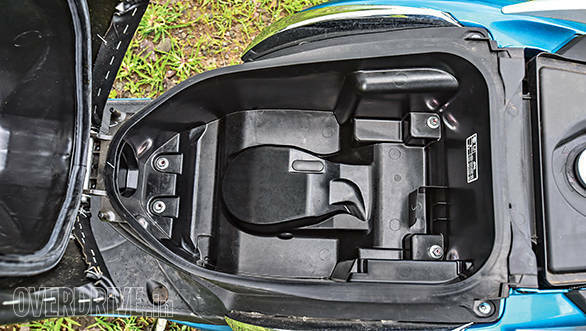 The Fascino comes with a 21-litre underseat storage bin that is shallow and wide to store knick-knacks and papers. Unlike the Alpha, the Fascino is more like the Ray when it comes to the floorboard - it's narrow and a bit small. Big feet or an aftermarket 'dickey', neither will be an easy fit. 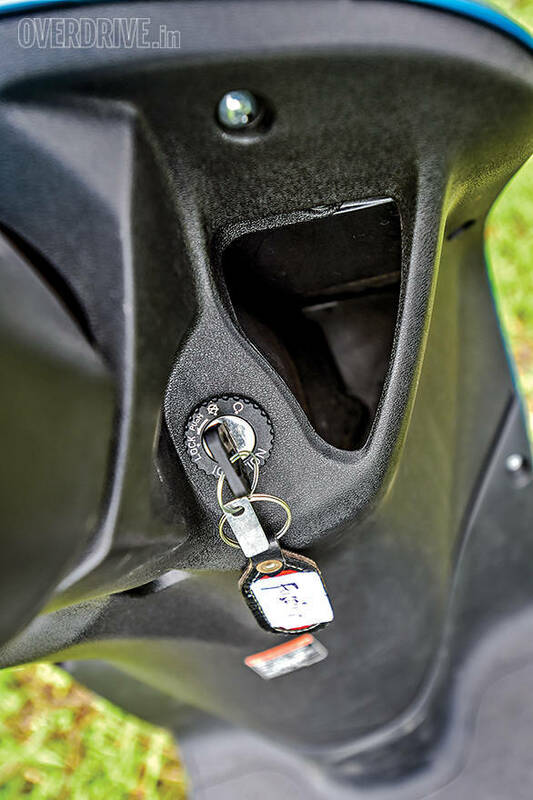 Yamaha does provide a cubby below the ignition key slot which can hold a bottle of water. It does not have a cover. There is, lest I forget, a hook under the seat to secure a bag or two. Both the Fascino and Ray/Z/Alpha are mechanically similar with the Fascino's lower (by 1kg) kerb weight being the only differentiator. 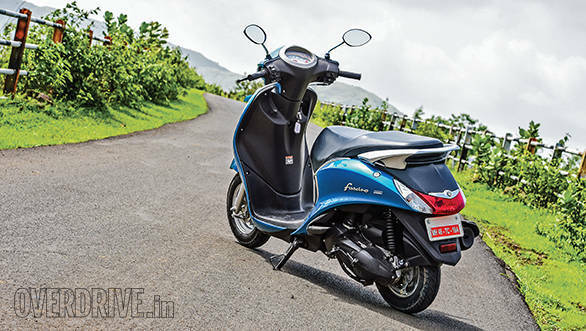 The Fascino is the most expensive of the Yamahas, though, at Rs 6,000 more than the Ray and about Rs 2,500 more than the Alpha.